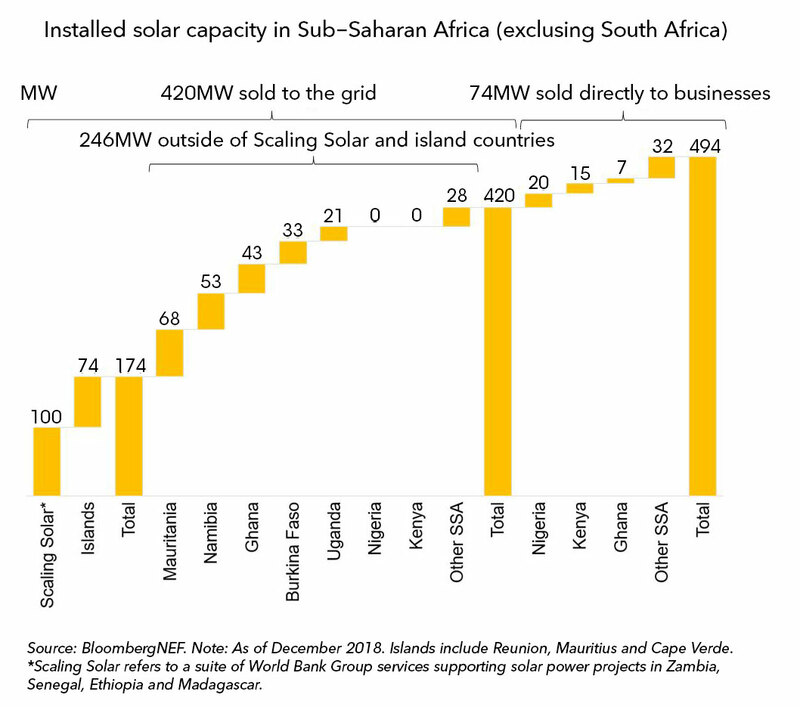 Outside of South Africa, Sub-Saharan African countries had only 420MW of solar plants selling power to the grid as of November 2018. This is less than 0.5% of the global installed solar capacity in 2017. It has also been highly concentrated in just a few markets that are either very small, or enjoyed significant development support, such as the Scaling Solar program. Utility-scale solar projects often struggle with administrative delays, unbankable PPAs and difficulties securing land. On-site solar for the commercial and industrial (C&I) sector can circumvent some of these challenges, while providing direct savings and a hedge on energy prices for its customers. Outside of the Scaling Solar and island markets, one in every four megawatts of solar capacity is selling power directly to an end-customer. 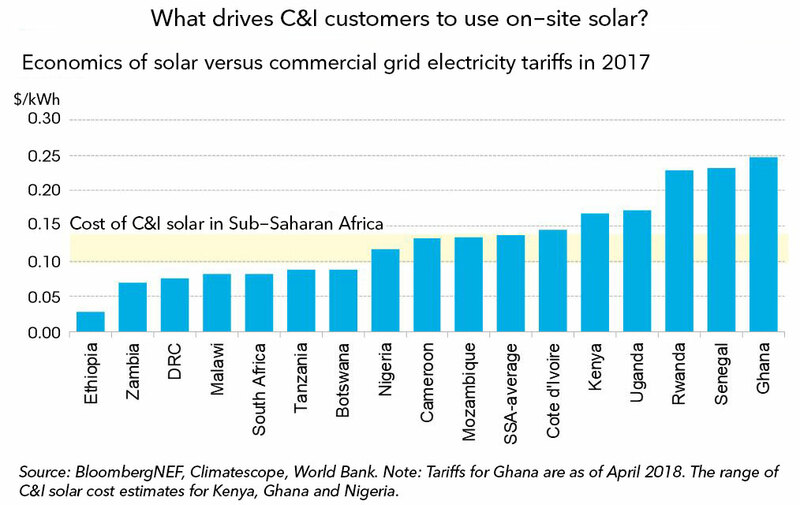 Electricity tariffs for C&I customers in Sub-Saharan Africa in 2017 ranged from $0.028/kWh in Ethiopia to more than $0.232/kWh in Senegal. A 250kW solar project costs between $0.10-0.14/kWh in the countries assessed in this study. BNEF projections suggest that the cost of on-site solar will decline further to about $0.05/kWh by 2030. These declines are set to strengthen the local solar industry in the long run. Electrical power outages are another reason for businesses to turn to on-site solar. These are commonplace across most of Sub-Saharan Africa, so businesses either shoulder high opportunity costs from lost sales or manufacturing output, or resort to much costlier backup power, usually from diesel. Finally, solar projects help multinational corporates to attain their own green energy targets. Despite those fundamentals, the market has just started maturing in the last two years and growth is slow. The financial sector has broadly been absent so far. The majority of projects to date have been sold for cash, without financing. Developers almost unanimously cite lack of access to debt financing as the biggest hurdle to faster growth. Customer awareness of on-site solar is another important hurdle, though it appears to be improving faster than a few years ago. 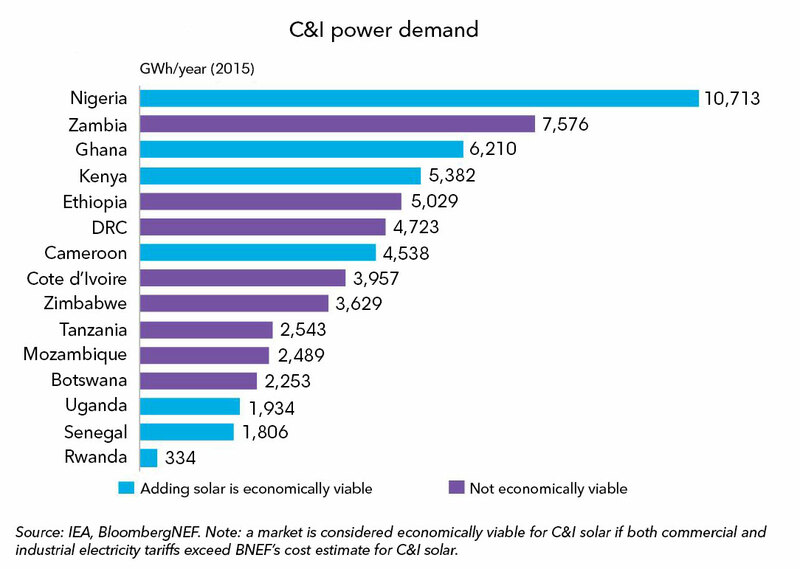 C&I power consumption from the grid in the seven countries considered in this study where on-site solar is economically viable totaled some 31TWh in 2015. The figure translates to an average load of 3.5GW. Because on-site solar is designed for using generated electricity where it is installed, this load can be thought of as a proxy for the maximum addressable market. In Kenya and Ghana, developers told BNEF they are working on pipelines of 26MW and 32MW, respectively. In Nigeria, developers reported a pipeline of 52MW. While it is unlikely that the entire pipeline will proceed to the final stages, BNEF expects 2019 will be another record year for the C&I sector in Sub-Saharan Africa outside of South Africa. This research has been commissioned by responsAbility to assess the potential and target markets for C&I solar in Sub-Saharan Africa. BloombergNEF undertook a desk-based regional study to identify three high priority markets (Kenya, Nigeria, and Ghana) that were later studied in more detail. There, BNEF conducted interviews with 36 stakeholders in those markets. The complete report can be downloaded from here.